A Shackleton puzzle is, for me, a cause both of keen excitement and much trepidation. Excitement because they are a joy to solve, and trepidation because they have, on a couple of occasions, nearly tripped me up. This week, there seemed to be some sort of building involved, but the last part of the preamble stated “Actual construction is not required.” Phew! However, we were faced with unnumbered clues in alphabetical order of their answers, with loads of 4-, 5- and 6-letter entries. That had the makings of a jigsaw where all the pieces are almost the same shape! Two objects were involved somehow, and a quotation and its author. Because there were bars on the left and right edges of the grid, it looked as though some words would wrap around. I wondered whether Shackleton had the same Tubular Bells idea that Samuel had three weeks ago. I suspected, however, that the editors would have spotted that. 18 Fashion from nineties one admired at Princeton? Yes, I know, I should’ve got EINSTEIN at 18 more quickly, but my letter doodling didn’t make him obvious; and what a sneaky definition. I finally succumbed to a dejumbler, and keyed FINE TO O N to reveal NINEFOOT at 30. A bit of examination of intersecting 4-letter entries meant that it probably went in the top-left or top-right quadrant, and with BE FOR IT as a possibility in row 5, I pencilled it into column 9. My grid was up and running. Next I put SONATA crossing the second O of NINEFOOT, and BOSNS in the central column. This latter turned out to be wrong, but you can’t get everything right first time with these puzzles. 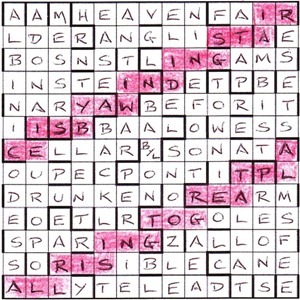 In the end it took at least another two hours to polish off Shackleton’s clues and fill the grid…with the exception of •AV•EN in the top row and BA•ON in the middle. Finally, the BYL of the overlong BY-LANES needed to swap places with the C of BACON to give the thematic location BABYLON, and another superb Shackleton puzzle bit the dust. I mused on his Listener offerings which covered Bela Lugosi, Jackson Pollock, Beethoven and Ernest Hemingway, in addition to the Listener Olympics puzzle last July. What would he come up with next? This entry was posted on 5 July 2013 at 4:00 pm	and is filed under Solving Blogs. You can follow any responses to this entry through the RSS 2.0 feed. You can leave a response, or trackback from your own site.